While Natalie may have a love/hate relationship with her Phil and Teds Sport, the last three years has been love love love for me and my beaten up old E3 (I think it’s the original model, now discontinued but still doing a roaring trade on eBay). So when I was offered the loan of a brand spanking new Phil and Teds Explorer to try out for a month I leaped at the opportunity (the decadence of having two Phil and Teds if only for a month was almost too much for me, the picture above is an accurate representation of my feelings on the matter). For one month we have been using the Explorer non-stop, in all terrains and weathers we encountered. The Phil and Teds range of inline sport pushchairs enable you to push one or two children of various combinations from newborn to five years. The inline design means that you are able to go where many other doubles can only dream of venturing as the width is little more than a traditional pushchair. The chunky pneumatic tyres, three wheel design and outdoorsy fabrics make it the perfect all terrain pushchair (and I include dodgy pavements in the rougher terrain). The padded push bar is as easy to handle two handed as it is one-handed-carrying-a-screaming-child-in-the-other. The Explorer is a progression from the Sport building on the success of the model and replacing it in the market. The development of the Explorer was in itself an innovation involving feedback from customers, social media and parent testers to tell the designers which features their beloved Phil and Teds was crying out for. 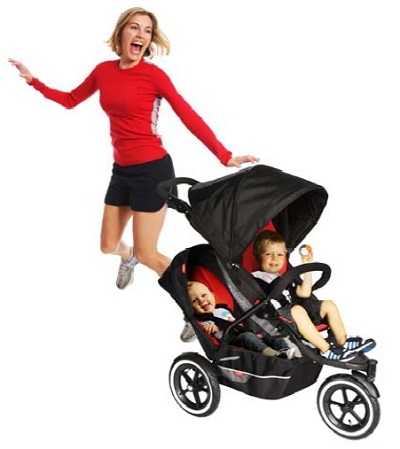 This user-led product development generated several genius improvements such as the one hand fast fold, ‘follow the sun’ sun hood and baby on top toddler on bottom position. Natalie’s biggest bug bear was the poor instructions and while they are still not a lengthy tome on P&T ownership the new illustrations are much clearer to interpret and have blown up sections to show you the important bits. If you’re feeling a bit lost then check out the instructional video below which shows a real life bloke setting up an Explorer from scratch without crying or reaching for the gin once. Personally, I would follow the video if I were setting up for the first time. Two child multi-positions: having used this type of pushchair through from one baby to two toddlers to a newborn and toddler to toddler and pre-schooler I am have never found a situation when I couldn’t transport my children safely and happily. 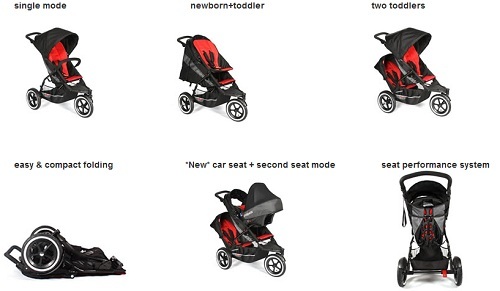 The new toddler on the bottom, baby in car seat on top (see image above) is absolutely brilliant for those quick dashes from the car to the shop when you don’t want to get your baby out of their car seat but it would be impractical for the toddler to walk. Adjustable handle: at the touch of a button you can adjust the handle which is great for switching between partners or transitioning from single to doubles kit. One hand fast fold: I had never thought about how cumbersome the old two handed fold was until I laid my hand on this system. This is one of the easiest folds of any pushchair I have used (pictured right). My top tip for getting it into the car is to position the pram so the handle drops on to the lip of the boot then pivot it up and over letting the car take the majority of the weight. New pedal brake design: the new brake is 100% flip flop friendly whilst still being as sturdy as its predecessors. Seat performance system: the new slightly more robust seat backing is more comfortable to sit in, the seat is close to upright and the adjustment is a piece of cake. Interchangeable seat liner: makes washing super easy and should some kind of accident happen you can whip it out and carry on. Five point harness: pure simplicity to adjust, easy to fasten and release for an adult but not so much for a curious toddler trying to escape. Sun hood: love the new multi-position function, extendable visor and love having one on the doubles kit. It also has two little pockets for stashing bits and bobs like drinks and snacks. Also see niggle below. Plastic footwell: really easy to clean and for older children to step on when climbing in. Place for cup holder: I didn’t try the cup holder but I was really pleased to see there is a location ready for you to hook your holder in place although I’m not sure I’d have a hot drink in it if there was a child in the back. Improved rain and sun covers: now easier to whip on and off. Weight: at 12kg (plus children) it is hefty to push up hills especially although probably good for my muscles. Sun hood: what I’m not so keen on is that it is pretty easy to knock off and often came off in the boot of our car. Length of the jogging strap: now I am being super picky – I use the jogging strap for older children to hold onto whilst we’re out walking and it is a bit of a stretch at the new shorter length (told you it was picky). The Phil and Teds Explorer is the perfect evolution of our favourite double pushchair. It brings forward all of the excellent design elements from previous models and adds so many more that going back to my beloved work horse will be harder than I thought it would be. RRP is from Â£399 for the basic single pushchair and it is worth shopping around for deals on bundles which will add the doubles kit, sun cover, rain cover, cocoon and other accessories. As always we recommend you check out the store’s reputation before making a large purchase like this. You can find your nearest retailer by using the retailer locator tool at the bottom of the Phil and Teds home page.